New Year, New Season, Same Goal. 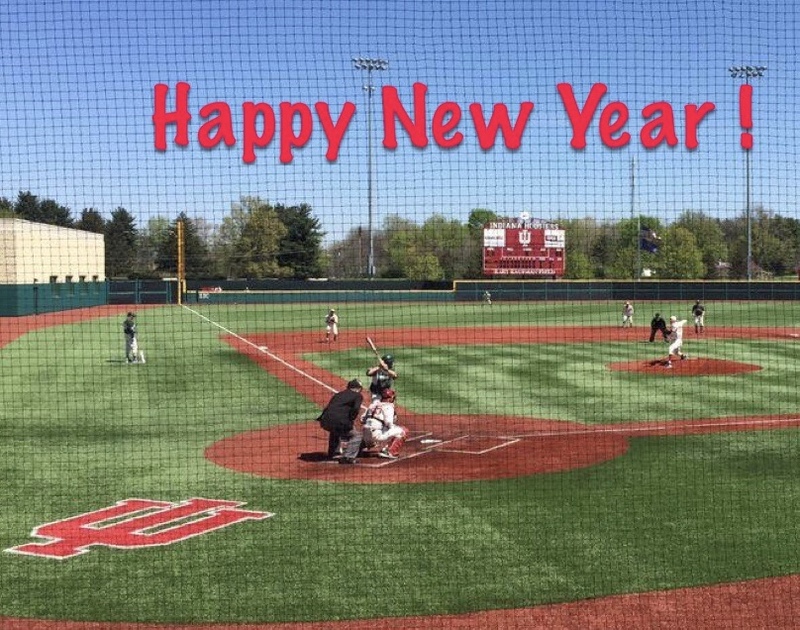 It’s officially the 2018 season of Hoosier Baseball. Of course the players have been on campus since the fall, but now we’re actually in 2018 and approaching Opening Day in Myrtle Beach on Friday, February 16th against Oklahoma. 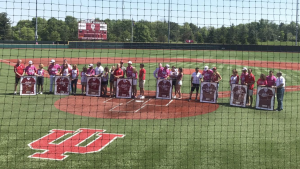 Let’s take one last look at the 2017 Hoosier Baseball season before moving on to 2018. Both followed the same formula. A solo homer by Tony Butler and Jonathan Stiever’s lights out pitching. Both W’s led to big series wins that were big for the tournament resume. That series started with a Friday night to forget at The Bart but had us all celebrating by Sunday afternoon . Lloyd had 9H, 8RBI, 6R, 4HR in a 3 game series. Later in the season he also redeemed himself after blowing a save with his walk off bomb into the night against Ball State. 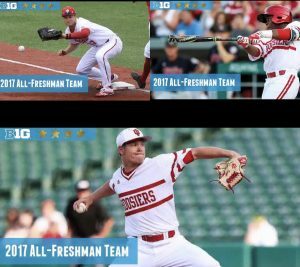 Who knew they’d play such a big part in helping this team so early in their Hoosier Baseball careers? Craig Dedelow’s grand slam into the teeth of the howling wind and rain!!! It secured the series win against the ranked Terps. The chants of “U! S! A!” as he rounded the bases were down right patriotic and so satisfying for all who endured that weekend! It’s something all players dream of doing, but no one believes it can actually happen. 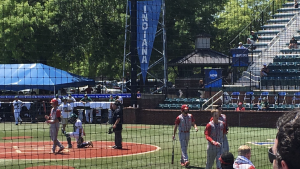 Three bombs in an NCAA Tournament game?!? Unbelievable! Sowers is the first Hoosier to ever do it, the seventh Hoosier to do it in any game. Clutch. Alex Krupa’s shot down the line to beat Michigan in extras in the B1G Tourney will be on the highlight montages on the new video board at The Bart for years to come! Last, and most certainly not least…. The Louisville Game. Over 3000 people were in attendance to appreciate just what Coach Lemonis does on a nightly basis. 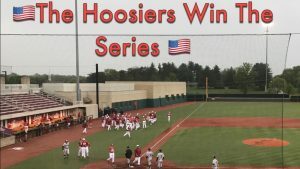 The Hoosiers jumped on the #2 Cardinals with a 4 spot in the 2nd (w, hbp, 2b, 2b, e). 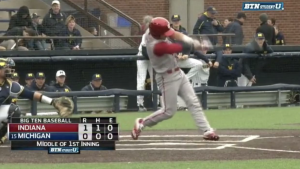 Louisville pulled within 1 in the 5th, 4-3. After that, every button Coach Lemo pushed was golden! 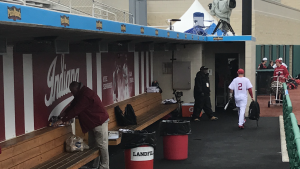 He called Sabol’s number first (2 innngs, 0 runs), Kryzsko was next (1.1, 0 hits), Timmy Herrin came in for one batter (National Player of the Year – Brendan McKay) and struck him out, to both preserve the one run lead, and give all the fans free Chick-fil-A. 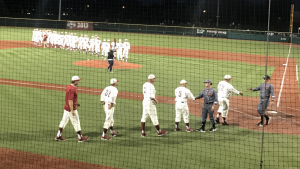 Closer Matt Lloyd came in to pitch a perfect ninth to nail down the most impressive win of the year for the Hoosiers! McKay finished the night 0-3, with 2 K’s. 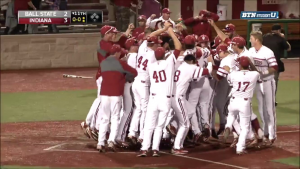 This win solidified a #2 seed in the NCAA Tournament for the Hoosiers. The postseason run was a short one, but 2017 was a season to remember nonetheless. 2018 means we must move on and try to replace the seniors from last seasons roster. Of course, Craig Dedelow, Austin Cangelosi, Tony Butler, Alex Krupa, Austin Foote and Luke Stephenson will be missed. 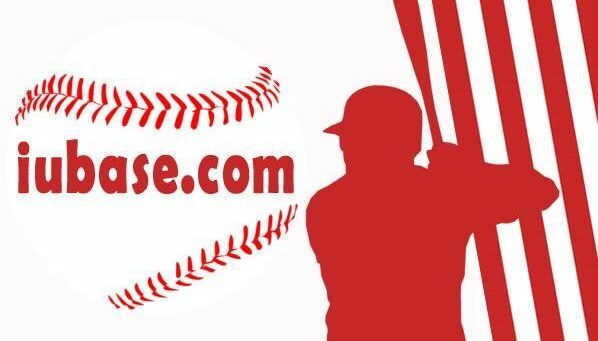 Soon, we will officially learn which incoming freshmen and Juco transfers will make this seasons roster. We also have a new member to the coaching staff. Zach Lucas joins the leadership team as Matt Reida has moved on to join the Xavier staff . The 2018 Schedule starts off with Hoosier Baseball participating in the “Baseball at the Beach” Round Robin Event at TicketReturn.com Field in Myrtle Beach, South Carolina. Hoosiers will play four games against four teams in four days at the beach. Next week we’ll start looking into the schedule match-ups as we’ll be getting even closer to the season opener. Maybe a little later in June this year!